I know this won't appeal everyone but would be helpful who has handset. these are pack of 40 I guess this is a bargain!!!! 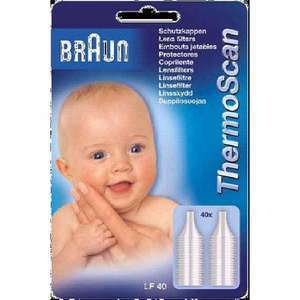 Braun Ear Thermometers work best with Braun LF40 Lens Filters. Take your temperature accurately and hygienically with these replacement lens filters for Braun thermometers. Designed to comfortably fit ThermoScan Ear Thermometers, this pack includes 40 lens filters, allowing you to protect your sensor from scratches and dirt for maximum hygiene between use. Each filter may only be used once, reducing the risk of contamination. The ear is regarded as the most reliable place to get a consistent reading of the humans core body temperature. You should measure your child's temperature regularly to understand their normal reading, so you can recognise signs of fever early. Thanks for posting. We used our last one last night. Ordered! Ditto - ordered 2 packs thanks! Thanks ordered a spare pack. Hot! Thanks, ordered a couple - hadn't realised how expensive these were until I went to buy replacements, so it has been sitting unused in a drawer for a month. thanks. great thermometer, crazy rip-off RRP for filters. nice find. The 200 pack works out at 5p a cover instead of 6.5p a cover. worth also saying that if you are testing the temperature of the same child in the same ear through the evening I don't use a new cover every time, only if I change ears or the test subject. got the 200 pack from amazon which is cheaper.